I’ve been really behind on blogging but with good excuse! I’ve been running from one conference to another, talking about GNOME and free software and having as many meetings as I can to forward our causes. It’s been really intense – I’ve basically given six talks in six days. First up was South by Southwest (and the most out of date report). As I mentioned here before, I was especially excited for this one in part because I was looking forward to the technically savvy crowd that may not be as familiar with free and open source software and also because my session was featured on the sxsw blog. This was a new experiment for the GNOME Foundation, and we were figuring things out. Happily Sri came to help and we were able to team up. We mostly hit the streets talking to people, which is surprisingly effective at sxsw since so many of the attendees are people we’d want to partner with in some way. We made some great contacts and have already been following up. My talk was pretty well received, and there were a couple of articles that came out of it too. One here and one in Le Monde”, for example. I was interviewed a few other times too, especially after the session with Snowden remotely dialing in. I was encouraged to hear him talk about how important UI is to free software which also gave me a good opportunity to talk about GNOME. I also got a few good leads on fundraising and partnership for Outreach Program for Women. Next year I’d love for us to partner with other free and open source software orgs and sponsors and have a Free and Open Pavilion in the expo floor. I think sxsw is an excellent audience for us to try to reach, if we can figure out a way for our presence to have the maximum impact. More recently, in the last week I was at the FSF’s LibrePlanet and the Linux Foundation’s Collaboration Summit. Both are great conferences. I always love LibrePlanet as it’s one of the few conferences that is entirely ideologically motivated, and I find it really restorative on a personal level. I had the honor of keynoting the conference again, entitled “We can’t all be cyborg lawyers: How messaging may be our most important obstacle,” where I talked about my experienced advocating for software freedom, marketing exercises done by GNOME and the FSF and how we can approach this going forward. I also led a session with Marina on diversity, and one with Deb on messaging. 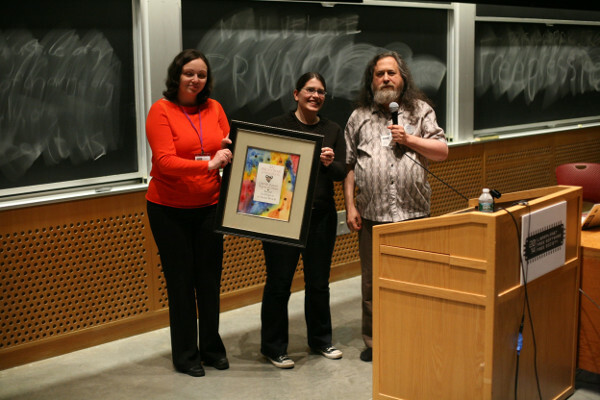 Marina and I right after Richard Stallman presented us with our award! You can read the whole press release on the FSF’s site. I also taught a course on legal ethics on the day after the conference, which also happily earned me some continuing legal education credits to boot. Later in the afternoon Marina and I got coffee with a few other advisors of the Ada Initiative which was really fun. I then flew to California for the Collab Summit, where I spoke on the Outreach Program and then again on issues about representation in Free Software. I’ll try to make an independent blog about some of my thoughts soon. This conference, while being almost opposite to LibrePlanet, was also really productive, and I was able to have a lot of great meetings. Now I’m off to finally have a bit of a weekend, there’s more news coming soon so stay tuned.